DHL, the world’s leading international express services provider, has found an even better route to meet urgent delivery commitments in the midst of traffic gridlock in the United States: through the air. A new helicopter service now provides early morning delivery services for several major banking customers in the downtown Los Angeles area. 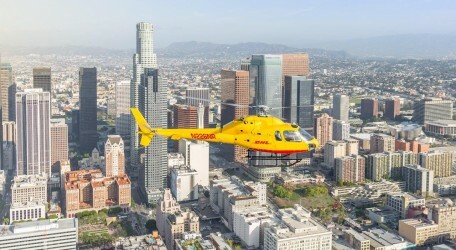 DHL Express has introduced the helicopter service into its Los Angeles operation as a way to guarantee an early morning 9 a.m. delivery service regardless of traffic bottlenecks. Initially used by specific financial services customers, this service will expand to include additional customers in the Los Angeles area. International shipments arrive at the DHL Gateway at Los Angeles International Airport, with specific packages transported by helicopter to a dedicated heliport in the city centre. A DHL courier meets the helicopter and provides the final mile deliveries. The DHL helicopter, a Twinstar Eurocopter AS355, is operated for DHL by Helinet of Van Nuys, California, and can transport over 350 kg of letters and packages. A DHL helicopter service is also used in New York, providing lifts from the DHL gateway at John F. Kennedy International Airport to prime US bank headquarters and Federal bank locations, making stops in central Manhattan and at New Jersey’s Teterboro Airport to speed deliveries of important financial and legal documents. « Let’s get on the bus!